This ad has always been one of my favorites. I like the way the 240 is positioned in the lower corner. It just makes me want to drive one again. 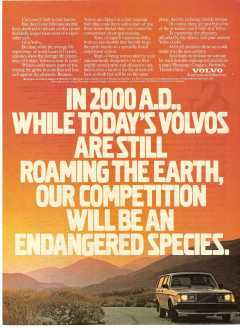 IN 2000 A.D., WHILE TODAY'S VOLVOS ARE STILL ROAMING THE EARTH, OUR COMPETITION WILL BE AN ENDANGERED SPECIES. Cars aren't built to last forever. But there's one 1984 automobile that's destined to remain on this planet decidedly longer than most of today's other cars. Which could mean years of traversing the globe in a car that will fare well against the elements. Because Volvos are dipped in a rust resisting bath that coats them with a layer of zinc three times thicker than cars coated by conventional electrogalvanizing. Years of superb maneuverability from an automobile that literally hugs the earth thanks to a specially tuned suspension system. comfortable and efficient to use, there's even a footrest for the drivers left foot, so both feet will be on the same plane, thereby reducing muscle tension. Of course, these are just but a few of the amenities you'll find on a Volvo. To experience the pleasures afforded by the others, visit your nearest Volvo dealer. After all, statistics show we could make it to the next century. A car you can believe in. *Based upon an actuarial analysis of 1981-1982 U.S. Registration Data conducted by Ken Warwick & Associates, Inc. Due to many factors including maintenance, driving conditions and habits. your Volvo may not last as long. Then again, it may last longer. Summary available at your Volvo dealer. ©1984 Volvo of America Corporation.